This simple duty is what gets us to jump out of bed on a Sunday morning. We are excited to do these little things during the Mass for Jesus. And we are overjoyed at the thought of being very close to Him, truly present at the altar, waiting for us to approach Him, to minister to Him, and to receive Him. As altar servers, because our first duty is in the celebration of the Holy Eucharist, our first love must also then be the Holy Eucharist. Love for the Eucharist should be at the heart of our ministry, and should be in the every line of our love story as altar servers. Only by developing a deep love for the Eucharist, by knowing it well, and being firmly devoted to it, will we be able to become good and holy altar servers of Jesus Christ. Love for the Eucharist is the foundation of a fruitful ministry as an Altar Server. To help us love the Eucharist, we must first strive to know and understand it better. After all, one cannot love what one does not know. And once we get to really know the Eucharist, and the Real Presence of Christ in it, it becomes almost automatic for us to fall in love with it and to place it at the center of our lives. The Church teaches us that in the Eucharist, Jesus Christ is present in a “unique and incomparable way. He is present in a true, real and substantial way, with his Body and his Blood, with his Soul and his Divinity”.2 Jesus Christ, true God and true man, becomes present for us, hidden in the appearance of bread and wine, every time the Church celebrates the Holy Eucharist. What a great blessing, as altar servers, to have been gifted and called to be near Jesus in the Eucharist! A consequence of our desire to know and to love the Eucharist more should be a constant petition to Our Lord for a stronger belief in his presence in the Eucharist. We should ask Our Lord, in those intimate moments of the consecration, when the priest raises the bread and elevates the chalice: “increase our faith!”7 We must remember this humble prayer especially at times when we fail to see things through the eyes of faith. This came to be known as the Eucharistic Miracle of Lanciano, an extraordinary event that is sure to dispel any cloud of disbelief about the presence of Jesus in the Eucharist. Just like the Miracle of Lanciano, the Eucharistic miracle in Poland, despite being hundreds of years apart, had the same result: the Eucharist is the very heart of Our Lord, and that it truly is, His body. These miracles are a source of consolation for us who, although not having seen, believe that it is Our Lord. These serve to bolster our conviction, especially at times when we find our faith lacking and we do not act as if He is really before us when we are serving Him at the altar. This faith, belief, and devotion to Our Lord’s Real Presence in the Eucharist should make all the difference in the way we approach Him and deal with Him, every time we are near Him and are serving Him at the altar. For if we truly believe that it is Jesus who is present before us in the Eucharist in which serve, how can we fail to stare at Him intently, to listen to Him closely, to give Him our undivided attention, to be at our best conduct, and to be wholehearted in our service? What St. Vianney saw, on which he fixed his gaze, moved him to tears, brought profound joy in his heart, and enabled him to achieve such heights of holiness, is the same thing that we see each time we are assisting at the Eucharist: God, hidden in the appearance of bread. We need not necessarily be moved to tears, but our faith in Our Lord’s Real Presence in the Eucharist, should be able to move anything that keeps us from approaching him, loving him, and serving him, in the best way possible at Mass. Ultimately, the key is knowing and believing that the Eucharist is Jesus Christ Himself. If we have this, it would be easier for us to generously give ourselves in our service, and commit to excellence and perfection in the way we carry out our ministry. We can look to the example of the patron saint of altar servers, Saint Tarcisius, to help us see how true devotion to the Eucharist can be lived out. His story is one that is sure to bring inspiration to every altar server and enflame the desire to love and serve the Eucharist in the way that he did. Just like Saint Tarcisius, you and I are also called to be selfless in serving Jesus at the altar. We are being relied upon by Christ to protect Him, to defend Him, and to take care of Him in the Eucharist. We are called to love the Eucharist to the point of becoming of one flesh with Our Lord. Indeed, the gift that we have received of being altar servers should be used at the service of that greater gift Our Lord gave us in the Holy Eucharist: His very own body, blood, soul, and divinity; His very Self. We have to try to love the Eucharist a little bit better with every day that passes, with every visit to the Blessed Sacrament, with every communion we make, and with every service at the altar that we render. You and I wish to live forever with Jesus, and to abide in him for eternity. That eternity begins today, by filling our lives with love for the Eucharist, who is Jesus Christ present in the here and now. There He is, the Way, the Truth, and the Life, eagerly anticipating us, and constantly offering Himself, so that we may have life, and to have it more abundantly. This means that the Celebration of the Eucharist, the Liturgy, is the life of the Church, toward which all her activity is directed, and from which all her power flows.27 The celebration of the Eucharist, simply put, is the most potent, most important, and most significant thing that we do in Church, and should be given the greatest importance and the highest priority. All of our other apostolic and charitable works, great as they may be, simply fail in comparison with the Holy Eucharist. This primacy given by the Church on the Eucharist should also be reflected in the lives of the faithful, especially for us, altar servers, who are in close contact with Jesus in the Eucharist each time we serve. Our closeness to the Eucharist should affect every aspect of our lives, and should be seen and felt by those around us. This should be expressed through what fills our minds, the way we speak, the way we behave, the way we treat others. Yes, even the way we dress, how we spend our leisure time, the books we read, the shows that we watch. Our closeness to Jesus as an altar server should have an impact on all the little details of our lives. The closer we are to Jesus, the greater our imitation of His life must be. As altar servers, we are called to live out our gift and calling to love and serve the Eucharist wherever we may be. We must strive, with the grace of God, to make our lives an example and a constant reminder of Our Lord’s life-giving love in the Eucharist. The Eucharist, as the “source and summit” of the lives of altar servers, should also mean that our Sundays must revolve around our participation or service in the Holy Mass. 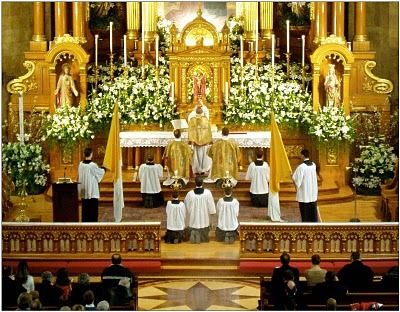 Going to Mass, or serving at Mass on Sundays, should never be a mere afterthought for us. It must be the first priority, and if possible, carefully scheduled at a time when we can best participate, and when our whole family can be with us. The Sunday celebration of the Lord’s Day and his eucharist is at the heart of the church’s life31, and must also be, for our family life, and our life in our ministry. However, care must be taken that we do not neglect the other obligations that the duty to keep Sunday holy includes. Sometimes, an altar server spends the whole of Sunday in Church, serving and enjoying the company of his other fellow altar servers, to his heart’s content. While this kind of availability to the needs of the Church is greatly admirable, an altar server must also make sure that he spends ample time with his family at home. In the same way that Jesus is present for us in the Eucharist in the breaking of the bread on Sundays, so too, must we strive to be present in the breaking of the bread at home in our family meals. Just as we are nourished with the Eucharist from the Altar of the Lord, we must also find nourishment from our family tables, relishing the company of the persons God has placed closest to us. We must be available to serve in our homes, especially for our parents, just as we make ourselves available to serve at the altar. Joel Arzaga is a 27-year-old from the Philippines. He recently graduated with a Juris Doctor degree and has been helping out in the formation program of the Liturgy Commission of his home Diocese of Novaliches since 2011. This is an excerpt of a booklet he is writing entitled: Love Story of Altar Servers: 7 Things An Altar Server Must Love.